What’s a fantastic way of being warm, comfortable and chic at the same time? In a velvet pants’ suit of course! This little outfit is definitely a favourite and it was yesterday’s Mother’s Day pick. Hubby took this photo in a park just after we’d been blessed at church with an inspiring message from our fabulous Pastor Christie Buckingham. Our senior pastors, Rob and Christie Buckingham, have recently returned from visiting Bali 9’s Andrew Chan and Myuran Sukumaran. Both men have no appeals left and can only be granted clemency by the Indonesian President. You can take a few seconds out of your day and help save these men’s lives by signing an online Amnesty International petition at www.amnesty.org.au/action/action/31694. Pastor Rob says the men do not want a “get out of jail free card”; they are simply asking to have their life spared so they can continue to do good in the jail. Their rehabilitation is not questioned as even the governor of the jail is requesting their life to be spared. 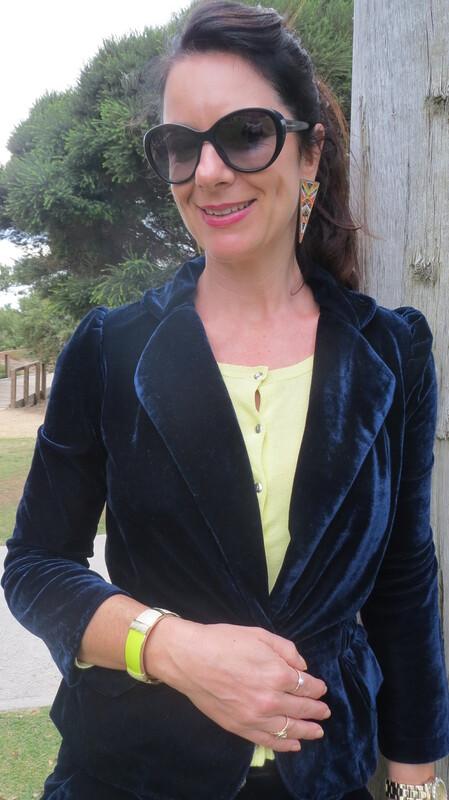 Back to the navy velvet suit – it was a special bargain I scored last autumn from my favourite Brighton boutique owner. It has fabulous long zips up both legs. I teamed it with a zesty yellow Zara knit and Wittner heels. After a bit of show-boating in the park I slipped into jeans and a leather jacket and we dined on sushi before running around the park with our boys. Polished off with milk shakes and coffee at a nearby cafe. Then it all went down hill when I cracked it with hubby for not making much effort . . . he later told me he’d ordered a gift and it hadn’t arrived yet! Oops. The highlight of the day was enjoying the boys, the cards they’d made and the gifts they’d selected from the school stall. They definitely are my heart running around on two legs! On the way home our big boy Hudson wanted to stop at the shops and buy me some nailpolish and a fashion mag (he’s obviously observed what I enjoy doing when he’s in bed!). I was in awe over such thoughtfulness. What did you lovely ladies get up to? Were you spoilt? And now you’re Looking Good Girls! “I will praise You because I have been remarkably and wonderfully made. Your works are wonderful, and I know this very well,” Psalms 139:14.